4Wall, Epson, & oogoog Bring New 3D Projecton System to UNLV Men's Basketball | Press Center | 4Wall Entertainment, Inc.
UNLV Rebels recently published a press release regarding a new 3D Video Projection Mapping pre-game show for UNLV men's basketball. We were excited to partner with Epson to provide eight state-of-the-art Epson Pro L25000U Laser WUXGA 3LCD Projectors. Read the full story reprinted from UNLV Rebels below. LAS VEGAS (UNLVRebels.com) - The world-famous pregame show that accompanies UNLV men's basketball's starting lineup introductions during home games at the Thomas & Mack Center is being enhanced with 3D Video Projection Mapping starting with Wednesday night's game vs. San Jose State. Thanks to a partnership between UNLV, Learfield, 4Wall Entertainment, Epson® and oogoog productions, each of the Runnin' Rebels' remaining home games will include a pregame show that brings Tarkanian Court to life. The new show is being sponsored by the Runnin' Rebel Club and Findlay Toyota. "We are enthused to be able to add this innovative new element to Runnin' Rebel games at the Thomas & Mack Center," said UNLV Director of Athletics Desiree Reed-Francois. "Being in the entertainment capital of the world, we are continually looking for ways to enhance the game day experience for our fans. This new presentation will highlight the history and tradition of the program, while also illustrating our exciting future. Thank you to the Runnin' Rebel Club and our community partners for their teamwork in making this project a reality." 4Wall and Epson have provided the hardware for the high-tech laser projection show that will be similar to what several NBA teams have recently done. Leveraging Epson's laser projection technology, the setup includes eight state-of-the-art Epson Pro L25000U Laser WUXGA 3LCD Projectors. Each projector delivers up to 25,000 lumens for incredible color brightness, and up to 20,000 hours of virtually maintenance-free operation. oogoog productions developed the content and used the Zenn Immersive System for content distribution, programming all projectors to converge, allowing one large image to play over the entire court. The new show includes 3D modeling, motion graphics, video and text overlays. oogoog utilized the pixel mapping technique, allowing for accurate tracing of all lines of the court, and alpha mask creation for pinpoint accuracy. 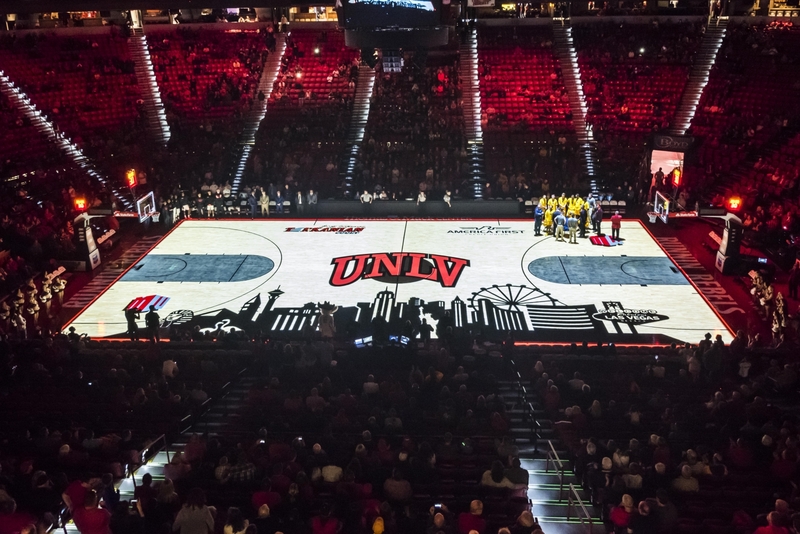 "Learfield is proud to partner with these leading companies to bring an innovative pregame show that highlights UNLV basketball and the city of Las Vegas," said Dan Dolby, General Manager of Learfield's UNLV Sports Properties. "This unique presentation highlights the current team and honors the rich tradition that is Runnin' Rebel basketball." One of the most iconic pregame shows in all of athletics, UNLV was the first to introduce pyrotechnic effects (fireworks). The fan-favorite show that Runnin' Rebel fans have become accustomed to will remain intact, as the additions are meant to enhance the experience. "4Wall is excited to partner with Epson in providing a state-of-the-art laser projection solution as the backbone for oogoog productions to create a game-changing experience for fans, students and athletes of one of the most iconic brands in sports, UNLV Runnin' Rebel Basketball," said Dan Abdalla, Vice President of Sales & Marketing for 4Wall Entertainment. "The show will be the "Wow" factor you expect from Las Vegas Entertainment and rival any NBA, NHL or college introductions." "It's an honor for oogoog to be included in this project," said Chuck Akin, Executive Producer for oogoog productions. "As UNLV Alumni we are always trying to help take the University and UNLV Athletics to the next level. Incorporating projection mapping on Tarkanian Court during the iconic pregame show just makes sense. It's the show before the show!" "When engaging the audience in an immersive projection mapping experience, ease-of-operation and confidence in the convergence of technology is key," said Gavin Downey, senior product manager, large venue projectors, Epson America, Inc. "We are proud to work with this talented group and provide Epson's laser projection technology to deliver brilliant color and exceptional image quality, along with flexible installation to create a seamless larger-than-life pregame display for Runnin' Rebel basketball fans." "Our long history of supporting UNLV Athletics has become a part of our brand," said Stephanie Bernas, Director of Marketing at Findlay Toyota. "We feel that being a strong community partner allows us to associate with UNLV's rich winning tradition. Cliff Findlay played for UNLV and has always looked to be part of the new traditions that help bring our community together. We are looking forward to having our name associated with this new pregame show." Tickets for Wednesday night's game vs. San Jose State, which begins at 8 p.m., may be purchased at UNLVtickets.com, by calling 702-739-FANS (3267) or by visiting the Thomas & Mack Center Box Office. About Epson - Epson is a global technology leader dedicated to connecting people, things and information with its original efficient, compact and precision technologies. With a lineup that ranges from inkjet printers and digital printing systems to 3LCD projectors, smart glasses, sensing systems and industrial robots, the company is focused on driving innovations and exceeding customer expectations in inkjet, visual communications, wearables and robotics. Epson's award-winning laser technology delivers remarkable color accuracy, easy set-up, and a virtually maintenance-free solution. Epson Pro L projectors are the first to integrate a laser-light source with an inorganic phosphor wheel in combination with inorganic LCD panels and Epson's proprietary 3LCD technology to deliver advanced performance, quality, reliability, and flexibility. For more information, visit https://epson.com/laser-projectors.